Two Chrome/Damon Edge Rarities Get Reissued On Special Limited Edition Vinyl! Los Angeles, CA – August 11 marked the 20th anniversary of the death of pioneering musician/songwriter/painter/madman Damon Edge whose profoundly gifted talents and indomitable spirit inspired numerous bands and artists both in his hometown of San Francisco and all over the world. In 1975, Edge founded the legendary experimental noise rock outfit Chrome, partnering with guitarist and fellow maverick Helios Creed for a string of albums from 1977’s Alien Soundtracks to 1982’s 3rd From The Sun that today stand as monuments of defiantly creative and uncompromising underground music. Chrome was, for the most part, a studio project that found Edge & Creed toiling away endlessly, experimenting with new recording techniques and sound designs. Live shows were extremely rare. In fact, the duo made a grand total of two public performances in its lifetime, which is why a bootleg recording of the group’s 1981 live debut at a music festival in Bologna, Italy became a much sought after treasure. Dubbed Chromosome Damage, this special release will be reissued on August 21 by Cleopatra Records. The reissue features new album artwork and remastered audio pressed onto gorgeous clear vinyl, plus a printed inner sleeve with detailed liner notes written by Chrome historian Neil Martinson. 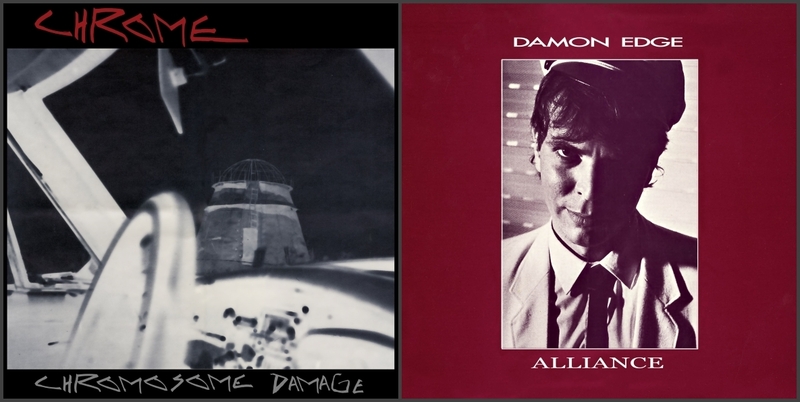 Also available on August 21 is a limited edition vinyl pressing of Damon Edge’s 1985 debut solo album Alliance. With the end of his partnership with Creed, Edge began to delve into the cold sterility of new wave, taking the metallic rhythms and chilly synth lines to new frontiers. Though Edge’s initial solo work was viewed as a step toward the mainstream, in reality he was as dark and subversive as ever, and Alliance shows an artist stretching to redefine himself without losing sight of his own uniqueness, a feat that Edge pulls off here with aplomb. Alliance will be issued in two limited pressings–a clear vinyl pressing, and a crimson vinyl pressing–both limited to just 500 copies each. Inside, a printed inner sleeve features liner notes by Martinson as well as a reproduction of the original release’s insert. It also includes a rare non-album track that has not been available on vinyl since it appeared as the B-side on the “I’m A Gentleman” 7” single. Both of these releases are fitting tributes to one of the most revolutionary figures in modern music and the patron saint of avant-garde artists everywhere, Damon Edge!